When looking for a good coffee, a home-made iced tea or a fancy cake or lunch, this is the place I want to go. The prices are fair, the quality of the food and drinks is excellent (I love the bagels!) and the location of this bar is just right: It is located in the fashion district (5 minutes walking from the museum of fashion) and is the perfect break when walking and shopping between the fancy Antwerp South and the old city center. All the above however, is not what makes Kaffeenini so amazing. It’s the trendy decoration and atmosphere that make all the difference. This former clothes store still has the large shop windows and therefore gets plenty of light, which makes it ideal to get warm on a sunny winter day. But it gets even better during the summer, when you can enjoy the weather on their enormous, yet cozy, terrace. 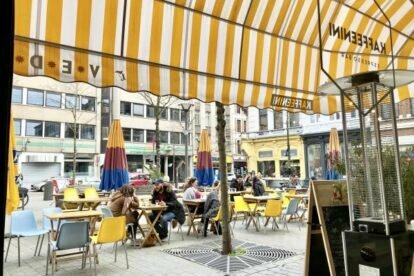 Their terrace is placed on a recently renovated square and the owner of Kaffeenini decorates it with colorful parasols and grass-like floors. It makes me feel like I am enjoying a lunch in a bohemian/hippie garden, right in the middle of the city.